We thought it would be a good idea to write a series on how to “not be mistaken for a tourist” in Bryson City! So here were going to explore the best places to eat, how to order and fit-in like a local. There are several outstanding restaurants in Bryson City and a few places you may overlook if not pointed in the right direction. Most have a specialty dish of some type and generally you will find Rainbow Trout prepared in a variety of ways on most menus. For the early riser that has to get that fix of coffee or espresso you have several options. Mountain Perks Espresso and Coffee is located directly across from the train depot. Great coffee, hand made bagels plus one of the best front porches for hanging out in Bryson City. The owners Jeff and Pam are always warm and welcoming. The Cork & Bean Restaurant is located in the old brick building on the corner of Main and Everett streets. This a beautiful old building inside and out and the atmosphere is wonderful. 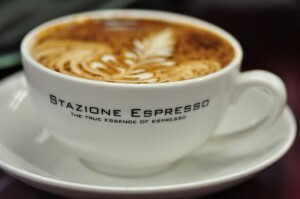 Some of the best coffee and espresso in town and be sure to order one of their Crepes! If you need something a little more substantial to get the day started, one of the local hangouts for breakfast is Everett Street Diner. Its located in a plain brick building with a small sign. If not careful, this one is easy to miss. Park anywhere on Everett street between the bridge and train depot. This is country breakfast cooking. Great biscuits and gravy, sausage, pancakes and atmosphere. This place gets really busy in the mornings so be prepared to wait a few minutes. The Skillet in Bryson City serves full breakfast plates. Another local breakfast option is the Iron Skillet. This one is a little easier to find. It is also located on Everett street. Look for the Hallmark shop and Bryson City bicycles. 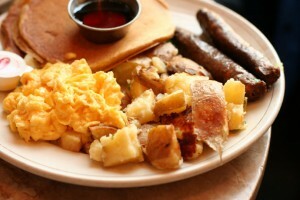 The Iron Skillet is located between them and has a complete breakfast menu and is very reasonably priced. This is also one of the easier places in town for parking. As a guest at Rock Creek Cabins it is our goal to integrate you into our mountain lifestyle. Have you meet some of the locals and try the real flavors of the mountains without resorting to the chain restaurants. We want you to find those hidden gems for food and drink that us “locals” only know about.